If you want to have a great time out on the water, then you’re going to need to select the best kneeboard to meet your needs. This is a very intense sport that is much like wakeboarding or water skiing, but instead of standing up on the board, you’re riding just above the water on your knees. If you’re thinking about taking up the sport or you’re looking to upgrade your skills, then this is the guide that you’re going to want to read today. Kneeboards might all have some basic things that they can do, but each make and model has some unique features that make it stand out. Use the chart below to locate the one kneeboard that stands out the most to you. What Are the Basics of a Kneeboard? The best kneeboards are broken down into three generic categories of equipment. By focusing on these three specific areas, you’ll be able to get the board that will perform the best under your skills and natural talents. Materials. Kneeboards need to be lightweight, yet still strong, no matter what your skill level happens to be. The best recreational kneeboards tend to be made with a polyurethane core or a sturdy foam with a fiberglass shell to keep the prices down. Professional grade kneeboards have a graphite shell. Fins. Some kneeboards have fins, while others do not. A kneeboard with a rounded edge and bottom tends to do better for tricks. Adding fins to the board will help with its maneuverability, so steering becomes easier. They’re good to have when first starting out, but may not be wanted afterward. Rockers. The rocker is essentially the curvature level that is at the bottom of the border. Lower rockers mean faster speeds, while higher rockers typically mean easier turns. You’ll then want to decide if you want a slalom board or a trick board. These board styles, combined with these features, will help you select the right board today. Solid kneeboard reviews from users like you are the key to a successful purchasing experience. Knowing whether or not you want a competition or recreational board is also important. Competition boards tend to be a bit thinner, but have a harder outer shell to resist more water impacts from tricks. Recreational boards are thicker, but more forgiving on minor mistakes. Here’s a Salty Dog pro tip: Beginner boards can perform tricks just as well as professional boards. It’s more important to get the feel of a trick and develop the skill of kneeboarding first before going to a thin graphite board, so almost all recreational users are going to prefer the beginner boards that are on the market today. The rotational molded foam is one of the nicest components of this handy little board that is designed with the intermediate rider in mind. It also has a patented hydro hook that creates a thinner profile and a great towing experience. There’s a 3 inch padded shock strap and deep knee wells to prevent unwanted fatigue. It’s responsive, light, and the water tension relief design that’s on the bottom of the board will help users stay in full control. The progressive edge will definitely help with trick development as well. 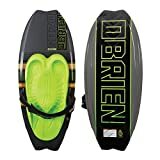 If you’re looking for the best kneeboard that is fast and clean, then you’re going to love the effortless air that comes from this beautiful board. Your landings are going to be smooth like butter thanks to the fine-tuning pad placement and how fast and clean this board is able to take off. It’s on the higher end of the price spectrum, but the investment is definitely worth it. With wood stringers in the foam core giving tricks and extra snap, there is huge maneuverability and sharp stability that every user will be able to access with this board. You’ve literally got to see it to believe it. This kneeboard is has a durable plastic base that works pretty well for most user applications. It’s not going to survive massive and repetitive air, so it’s more for the recreational user who wants to slalom like a water skier. The padding is useful and suitable for young kids, while there is enough flexibility in the design that it can work for adults as well. It’s a wonderful product, has a great price, and could be the best kneeboard for you. The best kneeboards offer a comfortable riding experience, a strong shell, and good padding for those huge tricks you’re about to land one day. Get started today with this extreme support, have an awesome afternoon, and you’ll be addicted just like everyone else who has tried kneeboarding at least once.